Experience Traditional Squid Fishing (Candat Sotong) in Terengganu, Malaysia! Showing off my catch at our second fishing trip during the Terengganu International Squid Jigging Festival 2014! Last April 11 to 14, I was invited by Tourism Terengganu and Gaya Travel Magazine to participate in a unique cultural celebration, the Terengganu International Squid Jigging Festival 2014 or Pesta Candat Sotong Antarabangsa Terengganu 2014. The huge media event was attended by over 250 delegates from traditional and online media including several bloggers from 25 countries. Grouped into teams of five, all the media participants set out on fishing boats to catch squid. On two fishing trips, we traveled for two hours from Kuala Terengganu to the open-water fishing grounds around the islands of Pulau Chepu and Pulau Kapas. Each trip took more than six hours, including travel time. The teams with the largest and most catch would be awarded the winners of the squid jigging challenge. A marshall holds up my squid on the first fishing trip! A type of handline fishing, jigging is the practice of fishing with a type of fishing lure called a jig, which consists of a lead sinker with a hook molded into it and usually covered by a soft body to attract fish or squid. Jigging for squid involves attaching colorful, feathered jigs with needle-sharp hooks at the end of a nylon line. Now and then, the line has to be jerked to lure and snag the squid. The fishermen of Terengganu have been using this traditional fishing method, locally known as candat sotong, for generations, and something the local tourism board wants travelers to Terengganu to experience, especially those who are interested in game fishing or angling. The freshly caught squid we all caught was grilled to perfection at Riyas Heritage Marina Resort. At the end of the four-day festival, the Filipino travel bloggers swept the social media prizes, courtesy of Tourism Terengganu and Gaya Travel Magazine! While I obviously failed to reel in the largest or most squid in the event, I won the “Most Active Social Media” prize for my live online updates, and one of the daily “Best Instagram Photos”, together with Gael Hilotin of www.thepinaysolobackpacker.com and Ivan Henares of www.ivanhenares.com. 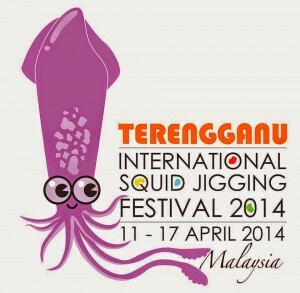 The squid jigging season in Terengganu runs from May to August. For more information on squid jigging tours in Terengganu, please contact Tourism Terengganu at 77A Jalan Sultan Sulaiman, 20000 Kuala Terengganu, Terengganu, Malaysia; Tel. no. +60 96262020; Fax no. +60 96262022; Email : info@terengganutourism.com. This blog post was made possible through the Terengganu International Squid Jigging Festival 2014, a media event held last April 11 to 14, 2014 in Kuala Terengganu, Malaysia. The event was organized by Tourism Terengganu and Gaya Travel Magazine. Did anybody got inked by the squid? Yes, some of us did! I love squid too! My favorite part of course was digging in all the squid dishes at the end of the festival. The grilled ones were tasty.